Good news: Sara Beltran Hernandez has been released! Sara Beltran Hernandez, a 26-year-old mother who fled violence in El Salvador and has been detained by Immigration and Customs Enforcement (ICE) in Texas for 15 months, has been released from detention to be with her family and to seek treatment for a brain tumour. More than 20,000 of you took action to flood the authorities with emails asking for Sara to be freed. Thousands of Amnesty activists in the U.S also demanded her release – even shutting down three ICE phone lines. It worked! Today Sara walked free after more than 400 days in detention, after thousands of you raised your voices. Thank you so much for your support - your actions really can make a difference. Sara will now be allowed to live with her family in New York while her asylum claim is processed. Under U.S. and international law, people can seek asylum there if they fear for their safety in their home country, and their human rights must be protected while their claims are being reviewed. We will continue to do everything we can to ensure protection for people who are fleeing violence. 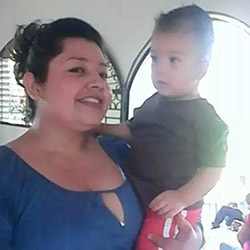 Sara Beltran Hernandez is a 26-year-old mother of two from El Salvador. Back in El Salvador, Sara says she suffered serious physical and psychological domestic violence, and was sexually abused. She also received death threats from gang members who are believed to have killed people in the past. Fearing for all their lives and unable to turn to the police, Sara fled to the U.S. to seek asylum with her family. Sara should have been treated with compassion. Instead, U.S. Immigration and Custom Enforcement (ICE) detained Sara in a detention centre in Texas, where she was held for the last 15 months. In February 2017, Sara collapsed and was transferred to a hospital, where she discovered she had a brain tumour. Sara’s lawyer and family were denied access and information about her condition for several days. Immigration officials seized Sara from the hospital where she was being treated and took her back to the detention centre. On 28 February, Sara was taken to a neurosurgery appointment in shackles and had guards in the examination room with her at all times, where they were privy to her intimate health information. She wasn’t given an interpreter for her appointment until the clinic insisted upon it. The neurosurgeon confirmed that Sara is suffering from a pituitary brain tumour that had bled into her brain. She requires ongoing surveillance and specialist care – treatment that the detention centre is not equipped for.